Review for Routines Bible, Terrible. More Likely to Hurt Your Game Than Improve It. "Terrible. More Likely to Hurt Your Game Than Improve It." One of the worst books I've ever reviewed - clearly not a lot of thought or experience went into it. Reading this book would do more damage to your "Game" than help. Instead of this book check out The Routines Manual Volume II which has good quality routines that are well designed. This book was clearly written by a member of the pick up artist community for someone else in the pick up artist community. It is definitely not aimed at the beginner, more like someone who has already been using some pick up artist routines and is looking for more. It contains exactly what the book's title suggests. It is a 66 page book containing 66 pick up artist routines. No other advice or tips. Just the routines. Reading this book had me thinking back to circa 2003 when routines were going through some of their early "growing pains" in the seduction community. This book has an out of date feel to it as if it was written then and never updated with the new information that was learned afterwards. I'll get into why in a minute, but first a bit of historical context will help you to understand where this book has come from and why we don't recommend buying it. When Mystery appeared on the scene in the late 90s and began promoting the use of 'routines' as a pick up artist there was no one else doing it. However, as his reputation grew, an increasing number of men from the seduction community began trying to design and execute their own routines. One of these members was Neil Strauss and another was TD (Owen Cook). The problem was here that the only way men had to learn the routines was from a few forum posts from Mystery and Style. These weren't very detailed and sometimes there were examples of routines, but really the whole context behind why to use each routine and when wasn't present. Style was Mystery's wingman so was able to learn properly from him seeing routines used in person and able to question him about the whys and whens. TD had the chance to meet Mystery in person and learn better from him, but his exposure was a lot more limited. TD posted a lot more on the forums, typically a few posts a day, while Style or Mystery no longer posted on the forums having founded the private forum "Mystery's Lounge". So men in the seduction community were learning routines from TD, since he was the only real source of information on them. A lot of information was lost in the transfer and TD had different ideas of why and how to use routines and was not getting the success of Mystery or Style. The end result was this. Hundreds of different routines were being used by men, but truth be told, many of these routines did not have any real purpose. It was like they were used just to fill up time or to keep some kind of conversation going with a girl. They were missing the most important part of the routine, the why and when. Routines should be designed with a goal in mind. Mystery's stack of routines were each designed to serve a specific purpose in the pick up, each one achieving a goal and taking him closer to the ultimate result of sleeping with the woman in front of him. The main problem with this book - The Routines Bible is that most of the 66 routines published in it lack a good why and when or purpose, other than to take up time and keep a conversation going. The exception is some of the openers listed in the book that would be fine to start a conversation. In our review of another routines book, The Routines Manual Volume II, we discussed the importance of routines having a goal and how that book does the job well. This book could have been improved somewhat just be organizing it with a structure. This book is less useful because it isn't organized. Basically you are just given a string of routines listed one after the other, with no categorization or order or effort made to organize them to allow the reader to follow. The first is an opener, the second is a texting routine that aims to sexualize a conversation, the third and fourth are opinion openers (this style of routine was used a lot circa 2003-2005). Beyond the issue that many of the routines aren't designed to achieve a relevant goal, is the fact that some of them are designed to achieve the wrong goal. One example is "The Big Comeback Routine". The purpose of this routine is to quickly get a girl's number and leave in a direct manner. If you've read any text and phone game advice you'll know that that is a terrible idea and is just likely to result in you wasting your time getting frustrated with a very flaky number. Finally, some of the classic pick up artist concepts like 'negs' that are used in these routines are executed wrong. As a result, they come off as insulting the girl, instead of creating the positive result that they are supposed to create. The writer clearly doesn't understand the neg concept. One example of these negs he Spencer Michaels recommends is to say to a short girl: "You should hang out with taller girls so that you look taller.". This is nothing but an insult and a typical error made by someone who hasn't learned the concept properly. If you are interested in learning negs properly check out Mystery and Venusian Art's Revelation product or Love Systems Magic Bullets product. There are some routines in this book that had me literally cringing at the thought of using them. The only word I can find to describe them is "Cheesy". These routines were overly focused on having a funny come back line which is more relevant to 'pick up line' jokes you may have heard or the old 'pick up lines' that men used to use which made it obvious they were interested in a girl. Think 1930s movies style cheesy lines. This point is more concerning. I would fear that someone new to pick up artist routines would miss the problems with these routines and think that the rejections they got from girls when using them were their fault, while they are actually the "routine's fault". There are quite a few routines included that use underhand, completely unnecessary and rather 'creepy' tactics to start conversations with women. They include things like creating sticky notes in a female's handwriting and pretending it was stuck on a girl's back and pretending to find 10 dollars on the floor next to the girl. While some people may not be bothered with this, there are implications for your inner game if you have to put effort into engineering fake situations to get a conversation started with a girl. It's just unnecessary when there are so many things you could say to a girl that don't require this subterfuge. Also there is the risk that she actually sees what you are doing and calls you out on it making the whole situation a lot more complicated than it needs to be. What makes this creepy? Think about it this way. If you have to put a lot of effort in to creating a fake situation to talk to a girl, she's probably going to think it's creepy afterwards. Half the problem with some of these routines is they make talking to women harder and more complicated, not easier. Which completely misses one of the goals of routines, which is for them to be training wheels to make it easy for guys to practice and get started. A huge error that is made in many of the routines in this book is that they use old social references that are now outdated. While in 2006 some of these routines would have been pretty good, using these in 2013 is likely to get a "WTF?" puzzled look from a girl. One example is the "There's Something About Mary" routine which relies on humor and call back references to the "There's Something About Mary" film from 1998. 1998 was 15 years ago and while I'm in my late 30s and remember the film, I found myself having to search around my brain for what the routine was referring to from the film. This would make it hard for the girl to relate to you and what you are saying from the first few sentences. Not a good way to start a conversation - it sets the situation up to make it harder for you and the girl. I did test this too, guessing what the response would be. I ran a few of these outdated routines by my 24 year old girlfriend to see what her reaction would be. I got the expected "Huh? What are you talking about?". So while some of these may work ok on girls in their 30s, they definitely won't work on the young 20s college girls of today. Some of the routines in this book were obviously taken from a line Spencer Michael's used once on a girl, thought was good, so added to the book. While doing this, he completely forgot to think about whether the same situation which made that routine relevant would EVER come up for the person reading the book. Here's an example to bring this error to life: "The Sleeves Up or Down Opener"
Walk up to a girl with one sleeve rolled up and one sleeve rolled down. Hold your arms out slightly in front of you and say…. 3) be in a situation where opening her made sense/ was reasonable. This is obviously borderline ridiculous. At Dating Skills Review we are obsessed about providing balanced reviews that point out both The Good and The Bad of each product so you are best informed. So what good can we say about this product? Well, there are a good number of routines that would serve as good openers (starting conversations with wornen). These are dotted around the book and don't have any of the major mistakes I outlined above (cheesy, unnecessary subterfuge or outdated social references). Some of these good routines have in fact heavily borrowed or copied the routine outright from the original Mystery, TD and other pick up artist's routines that were published between 2000 and 2005 in forums. So you may have seen them elsewhere if you have read a lot of forum type material. Result: If you can spot a good routine and understand why and when you should use it by reading it you would find a few new useful routines or ideas in this book (especially if you haven't read up on a lot of the original pick up artist routines). The other positive thing to say about the Routines Bible is that it is nicely formatted with a good book design. This makes it look professional, making a good first impression when you first open it. 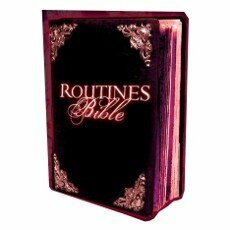 The Routines Bible is one of the worst books I've ever reviewed for many reasons. We highly recommend you do not buy it. It makes many errors of which the worst are: cheesy lines that are likely to get a girl 'cringing' and laughing because they' re so bad, lack of structure or purpose for the routines (lost essence of the routines), bad implementation of classic pick up artist concepts and routines that have lost their relevance because they make dated social references. If you want to learn more routines, a book that will provide you with well designed routines is The Routines Manual Volume II.